The Miami Hurricanes defense hounded Notre Dame into its poorest offensive performance of the season to drop the Irish to 21-3 and 8-2 in the ACC. The Canes moved into the #25 spot in the AP poll on Monday and kept the Irish off balance and at bay all game. Miami moves to 20-5 on the season and 8-2 in the ACC. The game was tight through each quarter until the fourth when Miami built an early six-point lead. Notre Dame pulled to within two twice around the mid-point of the final quarter but missed multiple opportunities on the offensive end to tie or take the lead. The Irish were called for a number of offensive fouls in the game — none more critical than an illegal screen on Brianna Turner with the score at 60 to 58 in favor of Miami with 4:12 left in the game. The Canes moved the lead to seven (65 to 58) before the Irish scored again. ND’s high scoring offense, which was stymied all night by Miami, had no miracle answers late in the game and only made 2 of their last 9 field goal attempts after pulling to within two. 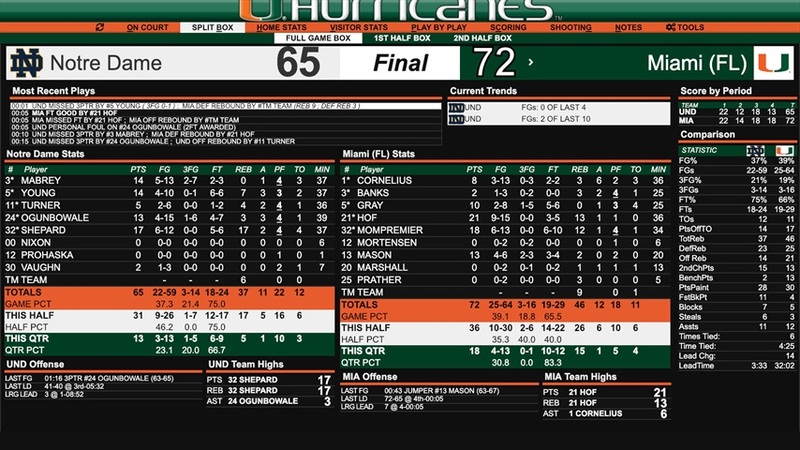 Miami made 5 of 6 free throws in the last 30 seconds to seal the win. Jessica Shepard led the Irish with 17 points and 17 rebounds. Marina Mabrey and Jackie Young each tallied 14. Mabrey started the game with 10 points in the first quarter, but only managed 4 the rest of the game. Notre Dame’s leading scorer, Arike Ogunbowale, was limited to 13 points. She was 4 for 15 from the field, 1 for 6 from three, and 4 for 7 from the line. She has been shooting poorly on the road in ACC play — and tonight’s shooting effort of 26.7% from the field, 16.7% from three and 57.1% from the line dropped her percentages for the five ACC road games played to date to 31.3% from the field, 18.5% from three and 68.6% from the line. The road figures are in sharp contrast to her efficiency at home in conference — 46% from the field, 40% from three and 88% from the line. She missed two free throws early in the fourth quarter to keep the Irish scoreless through the first three minutes. 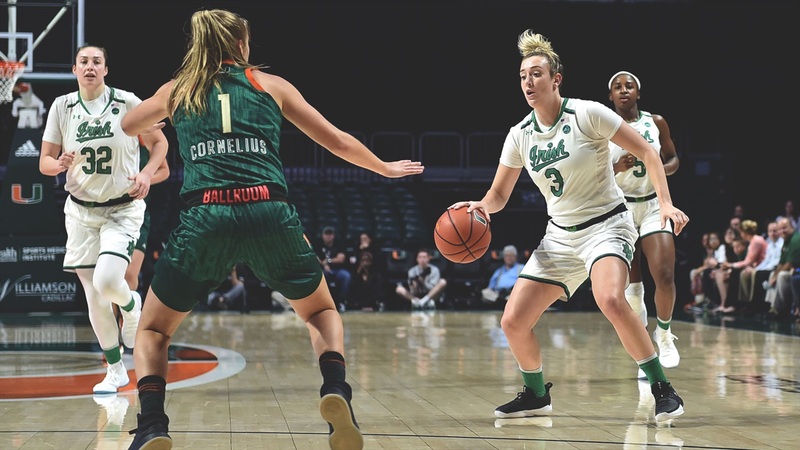 The best quarter for the Irish was the first when Mabrey made her second three-point basket of the game to knot the score at 22 just before the buzzer. The Irish were 9 for 19 to start the game, and just 13 for 40 (32.5%) over the last three quarters. Miami’s Emese Hof, the 6’3” senior forward from the Netherlands, had a monster night. She scored 21 points (9-15 from the field), grabbed 13 rebounds, had 4 blocks, and drew several charges. Miami’s leading scorer for the season, Beatrice Mompremier, added 18 points and 12 rebounds. "We lost the game because we couldn't contain the ball," Notre Dame head coach Muffet McGraw said. "They beat us to the basket. It cost us the game, same as it did at North Carolina. We've got to find a way to figure out what we can do on defense." 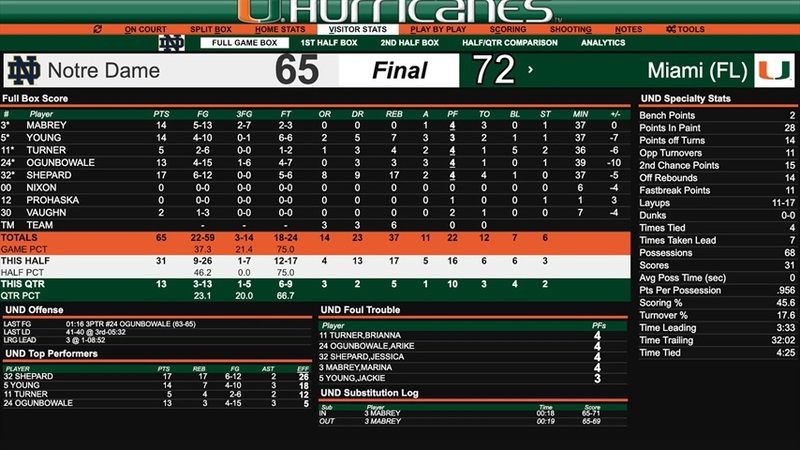 The Canes won the rebounding battle 46 to 37 and grabbed 21 offensive rebounds for the game. Notre Dame had 11 rebounds including 6 offensive boards to just 7 and 3 for Miami in the first quarter. Miami dominated the boards on both ends after that with 39 total rebounds to ND’s 26 and 18 offensive boards to just 8 for the Irish over the final three quarters. Notre Dame’s lowest scoring game before this loss was 71 earlier in the season at home in the loss to UConn. Notre Dame is now in a four-way tie for second place in the ACC with NC State, Florida State, and Miami. Louisville is in first place alone at 9-1 in the conference. Florida State, ranked #24 this week, beat NC State Thursday night 75-70 to move to 8-2 in conference. Notre Dame returns home Sunday for a noontime game with the Seminoles, and then the Irish still have two tough road games ahead at NC State and Syracuse. This is the second time Miami has beaten Notre Dame at home in the ACC — two of the five losses the Irish have suffered in the regular season since they joined the ACC six seasons ago.